New representative stadium planned in 1960s for the metropolis of Bangalore was to be a true giant. 90,000 people on three tiers, somewhat resembling the scheme later introduced in Kolkata, would make it one of the best stadiums in Asia. Except that never happened. Only the very first planned phase was implemented, seeing the western main grandstand grow to almost its desired height. But that was the only phase completed in 4 years (! ), supposedly because of plundering and corruption. To finance this hyper-inflated project the Karnataka State Football Association had to sell two plots of land right behind the stadium (currently occupied by Raheja Point and Raheja Plaza). This allowed to build the two-tiered north stand. Eventually, three grandstands were erected with the south end empty. This is where a slum began growing, removed in late 1990s. In early 21st century the main stand’s third tier had to be dismantled as it was in danger of collapsing. Thorough renovation of the stadium came in 2009-2011, co-financed by FIFA. It saw a new field and southern stand that accommodates local football academy. This proved an investment just in time to… demolish the stadium altogether. Such plans began surfacing soon after the stadium was symbolically enclosed in 2011, but have not been implemented to date. The stadium was created in 1993 on leisure grounds between four historical districts of Mumbai. 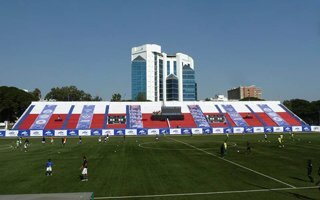 Initially equipped with modest wooden stands, it proved far insufficient in 2007, when Mumbai FC began playing here as the I-League took off. Great leap in infrastructure was enabled by FIFA, who donated $2 million in 2011 towards the stadium’s expansion. Synthetic turf, floodlights and 9 steel grandstands holding over 4,000 people were installed. Eventually the stadium is planned to expand in the future. Since 2014 Mumbai City FC are the secondary tenant. However, the ISL club (competition to I-League) uses much larger Wankhede Stadium as their main venue.